Chalco Hills Recreation Area, in southwest Omaha, is the Metro area’s premier outdoor recreation facility. At Chalco Hills, you can try your luck with fishing; relax at a picnic site; bike, hike or jog more than 7 miles of trails. The area is managed by the Papio-Missouri River NRD. The main entrance to this public recreation site is found at 154th and Giles Rd. Operation Hours: 6a.m. – 10p.m. seven days a week. 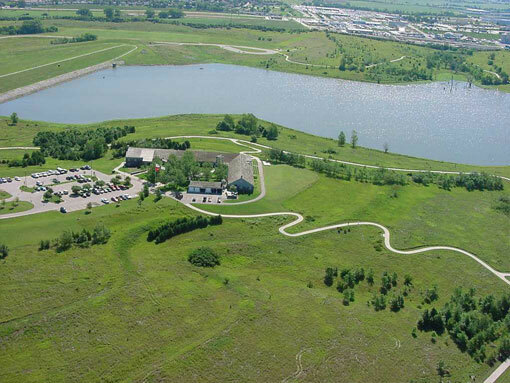 Featured at Chalco Hills is Wehrspann Lake, a 245-acre flood control reservoir considered one of Nebraska’s premier fishing spots thanks to angler’s support of catch and release. Wehrspann Lake is one of eight Papio Creek Watershed flood control reservoirs surrounding Omaha. The most common fish in the lake include Largemouth Bass, Catfish, Walleye, Sunfish and, Crappie. The lake is stocked by the NE Game and Parks Commission. Game and Parks Commission site. Featured at this recreation area is the Natural Resources Center, the NRD’s headquarters. Located in our building are two US Department of Agriculture Agencies: The Natural Resources Conservation Service and the Farm Services Agency, as well as a field office for the US Army Corps of Engineers, NE Department of Environmental Quality and the Civil Air Patrol. The District works closely with these agencies for effective management of our natural resources, and we are nationally known for this co-location of resource management offices convenient for all interested in our environment. Located at Chalco Hills Recreation Area, Wehrspann Lake is a 250-acre lake surrounded by 940 acres of trees and grasses. Recreational opportunities include fishing, hiking, biking, picnicking and nature studying. Wehrspann Lake at Chalco Hills Recreation Area is located near Highway 50 and Interstate 80 in Sarpy County. The area is managed by the Papio-Missouri River Natural Resources District. The lake, a flood control reservoir built by the U.S. Army Corps of Engineers, offers flood control to the West Branch Papio Creek Watershed. Designed and managed to be an excellent fishery, Wehrspann Lake opened to the public in August, 1988. Southeast Nebraska, including the Omaha-metropolitan area, contains only five percent of the state’s fishable waters. A Nebraska Game and Parks Commission survey conducted in 1990 on Wehrspann Lake shows that 14,514 anglers used the lake during a 77-day period. In comparison, each acre of Lake McConaughy in western Nebraska was fished an average of only two times during that same time period. Those figures at Wehrspann Lake mean that special measures need to be taken to save the fishery. Wehrspann Lake anglers are asked to follow a special size limit on bass. This 21″ limit is enforced to allow bass to reproduce at least once before harvesting, to create a trophy fishery and to control panfish. In an effort to protect the fishery, the Papio-Missouri River Natural Resources District encourages the practice of catch and release at Wehrspann Lake. The practice of Catch and Release is quite simple – Put Them Back Alive. The following rules apply. Be sure to wet hands before handling or measuring fish. If the line is deeply hooked in the throat or stomach, cut the line, as the hook will work itself out.